One thing that we’re all learning to accept as marketers is that the customer is truly in control. We might be able to influence things through sales, promotions and taste makers, but for most of us our impact is negligible in the face of what happens on the larger cultural scale. So we’re at the mercy of the market. The problem is, how do you predict where the market is going? This is where diving into your on-site search analytics can be tremendously powerful. By taking a look at what terms people are searching for on your site you can obviously get a good idea of where their interest is and what products people want. But if you segment that down further and start looking at trends such as “biggest movers” in what people are searching for on your site you can find a treasure trove of opportunity. The trick is you have to be able to identify things on the upswing – and be able to act on the insight while it’s still valuable. For example, if you’re a clothing retailer, a look at your on-site search might show a rising trend in searches for “red cardigans.” When you see that trend, then you can act on it. You can start stocking more red cardigans. You can start highlighting them on your home page. You can build a marketing campaign out for them. Most importantly, if you don’t stock red cardigans, you can act on that insight and start offering them. Content marketers have known for a while now that using Google Trends as a way to look at what topics are trending or on their way up in popularity are the ones worth focusing their content on. Marketers can do the very same thing with their own search analytics to build out their offerings, merchandising and campaigns ahead of the demand peak. Top “Failed” Searches: Look at the most popular search terms that aren’t bringing up any results. If you have those products, put in synonyms or redirects. If you don’t have them, find out if you can offer them and get them added ASAP. Poor Performing Searches: Set up a conversion rate metric for search term to order conversion, then choose a baseline for what you consider an “underperforming” conversion rate. Sort by # of searches, then filter out anything that’s meeting your threshold, and act on those terms. Biggest Movers: Look to see what terms are moving the most in your search. Often around events you’ll see a certain term jump to the top, but you can also see gradual increases in search activity. Both are important to look at. Your on-site search analytics (and browse behavior) are the best indicators of what your customers are looking for and give you the clearest insight into consumer intent. Keeping a close eye on this information can reap huge rewards in the effectiveness of your merchandising and marketing efforts. Companies who pay close attention to this data will be able to see trends as they start to happen, and be able to in effect predict the future as to what will be start to be hot once the rest of the public starts following suit. 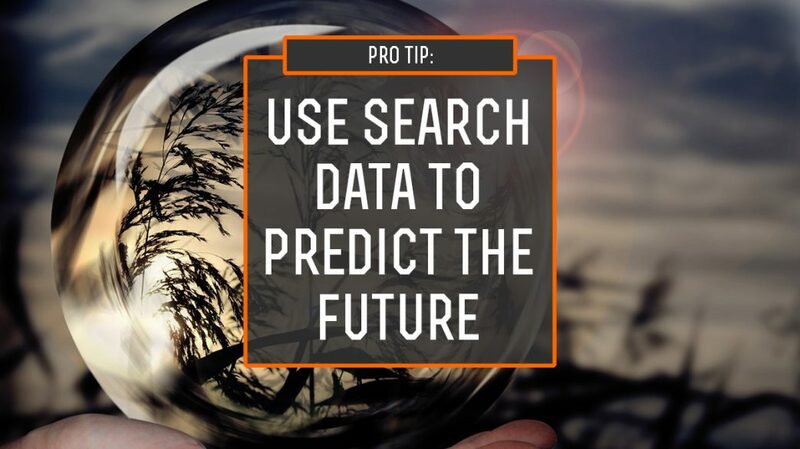 Not only that, but predicting based upon trends in your search can help you set your own future as to how well you will perform. Yes, it’s reactive marketing to some extent – but it’s using reactive marketing to build out predictive strategy. And in the end, isn’t having what the customer wants what really drives sales? Well now you can know ahead of time.